This book differentiates itself by focusing on botany. It's very detailed and practical and consequently very helpful. It provides lots of detailed facts, useful information, tips and techniques - doubtless derived from the author's many years of teaching botanical illustration and developing a diploma course. ​When you've got a many botanical art books as I have it takes something special to make a book stand out. I think the emphasis on the botany and very practical issues in Valerie Oxley's book succeeds in doing just that. This an essential reference book for any botanical illustrator, those who aspire to be so and those who teach. provides an excellent primer on materials and equipment required. a softback book which won't lie flat easily. Potential problems if used a lot - as it surely will be! more information about fugitive pigments and modern replacements would have been helpful. I always take a good look at who is writing a book as well as the content when reviewing it. It's certainly worth noting that Valerie's botanical illustration credentials are very impressive. developed the prestigious Diploma in Botanical illustration with colleagues at the University of Sheffield, Department of Lifelong Learning (TILL) and was its Programme Director. Vice-Chairman of the Northern Society for Botanical Art. Chairman of the Florilegium Society at Sheffield Botanical Gardens. Free-lance tutor teaching adults at residential colleges throughout the country. Find further details of her workshops on the SBA website. She has exhibited with the Society of Botanical Artists, the Linnaean Society and the Museum of Garden History . I particularly like the flow of the book, starting with the history and moving through all the things you need to know before you can start to paint. There are seven chapters before the book gets to Chapter 8 Preparing to Paint! The book is about botanical illustration (rather than botanical art) and consequently starts with a very strong emphasis on the botany. The book in general has a bias towards the requirements for correctness in botanical illustration. ​However I did think that the section on the naming of plants in Chapter 15 really needed to be in Chapter 2 so that the identity of a plant was clear from the outset. It's how to name the plant on the illustration in an attractive way which deserves to be in Chapter 15. The Materials and equipment chapter is much more thorough than usual - and could be a reason on its own for buying this book! This is a very detailed chapter about collecting, transporting and preparing to draw plant material. I find this is a topic which tends to be skipped or is not otherwise given a chapter of its own in other books - making this chapter is an absolute "must read" for those new to botanical illustration. how to hold them in place for drawing purposes. ​This chapter provides a very salutary note about the problems of drawing flowers from a florist due to mutations! ​It also has a very useful checklist of what to observe and pay particular attention to. ​A very helpful chapter which provides detailed descriptions about 'how to draw' techniques in the chapter Starting to Draw. This highlights both skills you need to practice in advance to approaches which make life easier and tips for making decisions about what to draw and what to leave out. ​This chapter summarises and discusses a variety of different techniques for developing tone and provides a list of useful reminders. This starts with a useful discussion of different types, formats and sizes of watercolour paper. It includes very detailed instructions for how to stetch watercolour paper - a topic which I've found in the past is all too often summarised at too high a level in many watercolour books - or omitted entirely! If you've never seen a demonstration these instructions will put you on the right path! The instructions about to transfer a drawing include all the traditional methods. I'd have liked to see a lot more practical examples about mixing colours in this section. Although helpful it doesn't quite match the calibre of information in the rest of the book. This chapter covers the basics of different techniques essential to the watercolour artist who wants to do botanical illustration. Chapter 11 - What do I paint? 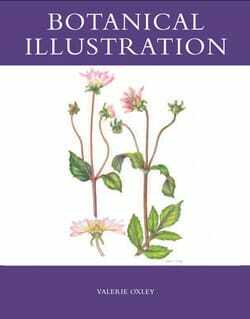 This takes a slightly different approach to most books and starts by discussing the different ways botanical illustration has been approached - and highlights different categories of illustration. Chapter 12 - How do I paint? Builds on the previous chapter about watercolour techniques and provides lots of practical examples for how to paint using watercolour. In other books this would be the most important chapter - in this book it's just one of sixteen. This is about placement of the plant on the page and how to deal with aspects like the focal point, the boundaries, the design of positive and negative space, stems which cross, what to do about roots, how to document a life cycle and how to include your signature. I very much liked the fact that an early recommendation was to study those artists from the past who were masters of design. ​The value of observation and how it works at different levels is also one of those recommendations which will stay with anybody who employs it. ​This is an invaluable chapter. She not only provides tips about how to check for mistakes but also tips about how to avoid making mistakes in the first place! I'm not quite sure how one finds a rabbit's knucklebone - but I now know what to use it for! Plus what to do if you do make a mistake (eg how to treat cockled or buckled watercolour paper). When all else fails, the time-honoured way to deal with an unwanted paint splash is to turn it into a leaf,flower or insect! Valerie has some invaluable tips and guidelines for how to photograph plants in the wild - another "must read". This book does not tail off at the end. This was first published as a book review on Making A Mark Reviews on 11 May 2009.